It is with sadness that we gather again this morning at a Mass of Resurrection to remember our Sister Reina Paz Kakilala. It is also with joy as we celebrate her direct encounter with the living God she loved and served so faithfully during her long life. 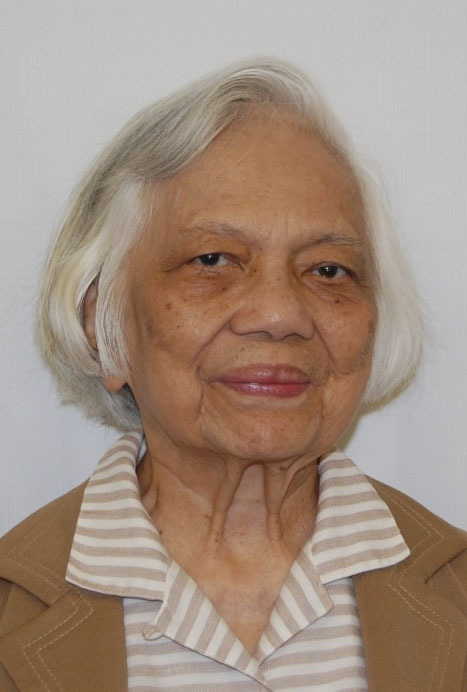 Sister died at the Maryknoll Sisters Center on May 3, 2015. She was 87 years old and had been a Maryknoll Sister for 64 years. Born in Cadiz, Negros Occidental, Philippines on February 25, 1928, to Fortunato and Visitacion Escalona Kakilala, Sister Reina Paz, the name she received at her Reception and kept throughout her entire religious life, was baptized Camilla Kakilala. She was the sixth child in a family of seven. Her parents, sister Clara Kilayko and brothers Tomas and Cecilio Kakilala pre-deceased her. Camilla Kakilala entered the Maryknoll Congregation on September 6, 1950 at the Motherhouse in NY, from Santo Nino Parish, Bacolod, Philippines. She made her First Vows in 1953 at the Motherhouse and her Final Vows on March 7, 1959, in Manila. She graduated from Negros Occidental High School and Institute, Bacolod City, in 1947. Before entering Maryknoll, she attended the University of Santo Tomas in Manila, and the College de San Augustin, Iloilo city. She graduated from Maryknoll Teachers College at Maryknoll with a Bachelor in Education degree in 1955. Due to immigration complications at the time, Sister Reina Paz served in her native Philippines for her first ten years in Maryknoll. There she taught first and second grades at Maryknoll College in Manila from 1955-1962, served as supervisor of a grade school in Jimenez from 1962-1965, then as principal of the grade school at Maryknoll College, Manila from 1965-1970. She also worked in community development during the Marcos years in her home country during the late 1960s. Sister Reina Paz worked in British Columbia and Alberta, Canada, for a religious education institute and local parish from 1970-1971. With immigration issues resolved, Sister was sent to Stockton, CA, where she was an organizer of Bayanihan, a community project to help retired farm workers in the vicinity find employment from 1971-1973. She also worked for West Coast Community Surveys, a non-profit organization in the region, from 1973-1974, and developed Tayo-Tayo, an organization which employed retired farm workers in hydroponic tomato farming. Sister Reina Paz described herself as “creative in thinking and writing”, and her activities would certainly bear this out. Whatever she did, she did at a high intensity energy level. In many ways she was practical, interactive and contemplative. She was adaptable as described by Mother Mary Joseph; and not afraid of taking risks, another characteristic of many Maryknollers. She was also a very trusting person. When others failed her in that trust or when her charitable ventures did not work out as she would have wished, she was sensitive to suffering but resilient. A person so creative, independent and committed to justice was bound at times to run into conflict with self and others while striving to service God faithfully. Perhaps her poetry was her most significant tool for reconciling these differences. She was a visionary and a prolific poet having written hundreds of poems on a variety of themes: nature, beauty, seasons, children and various aspects of the spiritual quest. She succeeded in publishing many of her poems. She won the Golden Poet Award in 1989, and is included in the American Poetry Association’s Anthology, the New York Poetry Anthology, Poetic Voices of America, and honored by the National Library of Poetry wherein she won the 1988 Editor’s Choice Award, being chosen as one of only 135 individuals out of over 10,000 entries. Sister Reina Paz returned to the Maryknoll Sisters Center in 1986, where she continued to write poetry, worked in the Congregation’s Promotion Department and as a driver for elderly and infirm Sisters until various health issues forced her to retire in 1993. In the holy Presence of Our dear Lord, I assure everyone, I have forgiven and feel no need to forgive anyone. I pray that you all feel the same for me. I thank God for all of my eighty years (almost). I treasure many experiences of your love and kindness. Patience and generosity, too. Above all, I take with me, the many touches of God which I hold precious because of you. Thank you for all you are. This is brief but the thoughts behind it, even now, are unfolding in eternity where they will always be vibrantly fresh, true and full of light. May we always keep one another in His Light, Life and Love from whence true peace and joy flow, Blessed Mother, All the Saints and Angels continue to guide you deeper into the God longing of your true self and make your awareness of God’s Real Presence ever open to Life Eternal. I place my love for all of you in His flaming Resurrection Love as I dearly thank you. This morning we are happy to welcome with us many of Sister Reina Paz’s relatives and friends. We also welcome our brother, Father William Galvin, MM, who worked in the Philippines for many years, who will preside at our liturgy of Christian burial this morning.